Hickory was an indispensable wood to the settlers. Its tough hard wood was and still is used extensively for tool handles and wheel spokes. President Andrew Jackson was even called “Old Hickory” because of his tough and aggressive personality. The Hickory tree actually covers 19 species of tree. The particular Hickory we use Texas Swamp Hickory. It grows in the swampy creek bottoms of my native East Texas and is a close relative of the Pecan. It’s often used as a smoking wood since it burns long and imparts a wonderful flavor to meat. The wood is a medium tan color with insect marks interspersed throughout. These markings giving Swamp Hickory a wonderful character. 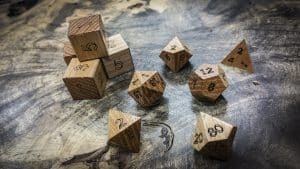 I would love a set of hickory dice. How much for a full polyhedron set? now the the kickstarter has ended we will be adding the prices to the website shortly. Thanks for the quick reply. These dice are so awesome! Is there a way to see the actual dice made of each specific wood?